Police have criticised 'inconsiderate' and 'reckless' drivers on Dartmoor after parked cars blocked roads for emergency services. Following the heavy snow and icy conditions in the area over the last few days, several roads had been closed for safety reasons. 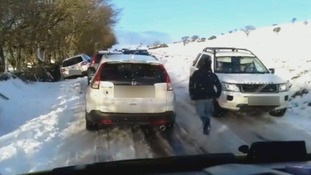 However, pictures and videos shared on social media clearly showed that many drivers had ignored the warnings and headed out to the moors. Devon and Cornwall's rural affairs team tweeted that they were "frustrated and disappointed" by the "stupid decisions being made by drivers." Some of the roads became impassable, causing a major problem for one ambulance crew on blue lights, who were on their way to Haytor to reach a patient.